Designated Common Mobile Aircrew Restraint System (CMARS), it is designed to reduce injuries and/or fatalities caused by combat damage, hard landings, aircraft crashes and evasive maneuvers. The mobile aircrew members are at great risk of injury because they may be required to move around within the cabin at any time during the flight to perform various essential job functions. At times they are even required to lean out of the aircraft to accomplish assigned tasks of the mission. Until CMARS is installed in these aircraft, the aircrew must rely on a low-tech restraint method consisting of a chest strap and an adjustable length tether referred to as a “gunner’s belt” that is attached to tie down points in the aircraft. The 10-foot tether is difficult to adjust and is frequently at full length. 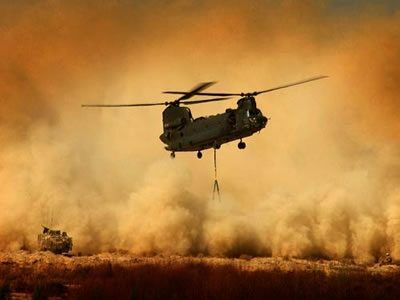 This has resulted in several instances of aircrew being severely or fatally injured by being ejected from the aircraft during evasive maneuvers or survivable aircraft crashes. 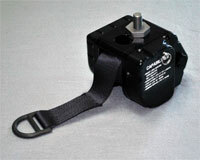 The Wolf CMARS is a self contained six-pound unit that can be readily mounted to the floor, ceiling or sidewall of the aircraft. It has a 112-inch safety belt made from polyester webbing. The exposed end of the safety belt can terminate in either a hook or a ring making it readily attachable to any aircrew vest or harness. Slack in the belt is prevented with the use of a retractor spring. CMARS contains a battery powered electronics suite that senses aircraft acceleration and belt velocity. The crew member attached to the safety belt is allowed complete freedom of movement under normal conditions with the safety belt extending or retracting as the crew member moves about the cabin. CMARS will lock if an acceleration limit is reached, such as in a hard landing or a crash, or in the event that a crew member would fall, preventing further extraction of the safety belt. This significantly improves the probability that the crew member will remain within the aircraft, thus reducing the chance of serious injury or fatality. If you believe CMARS is applicable to your needs, please contact us at 800-783-9653. We would be happy to provide additional information.